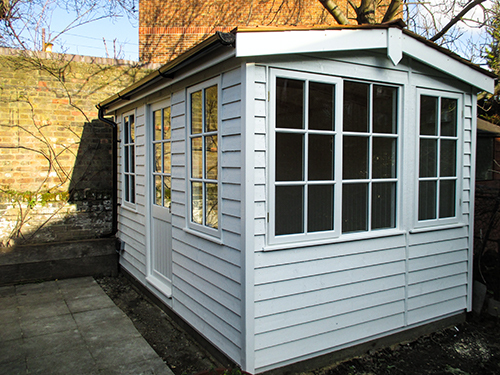 This Langham Garden Studio was recently installed in Greater London and makes the perfect work-from-home office. Measuring 2.4 x 3.6m and being painted in our Valtti shade of Ivory, it’s an ideal addition to a central London garden. The customer opted to have the apex roof covered with cedar shingles and black guttering added for further protection from the elements. Internally, the building enjoys 4 opening, desk-height double-glazed windows with Georgian crosses, an electrical pack with heater and full insulation with painted lining. 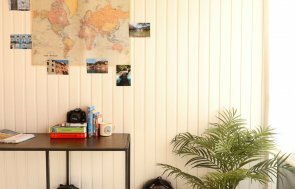 This means the studio will remain fully functional throughout the year with manageable temperatures, essential when being used as an office. The finishing touches to the exterior of the building include the optional weatherboard cladding for a more rustic look, and polished brass door furniture which finishes off the overall look of the Langham. Alternatively, you can get in touch to talk to one of our friendly experts or even pay us a visit at your local show site. 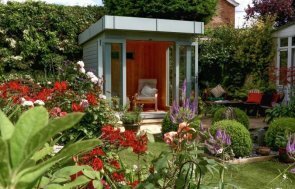 Our show centres are located across the UK and provide the perfect opportunity for you to experience the luxury of the buildings in person - there are over 25 buildings on display at each show site, so with the help of our expert team you are sure to find a garden building to meet your requirements. 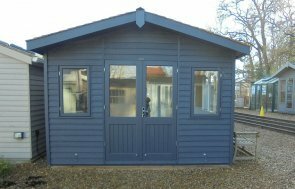 In order to browse our full range of Garden Studios, please visit our extensive Garden Studio by clicking on the link below.